Providing personalized real estate services in Tucson, Oro Valley, Marana, Vail and surrounding area. Combining Old-Fashioned client service with cutting-edge technology allows me to keep my clients well informed, in touch and aware of the marketplace. I believe in straight talk and real answers: You won't see me "Blowing Sunshine" at people or making things up just to look good. If I don't know something, I'll tell you-then work to find the answer. Smoke & mirrors are wonderful for magic acts, not Real Estate. Come see me in Tucson-we'll get comfortable and jump into my pickup truck to look at what properties interest you. Afterwards perhaps you'd like to take in an Opera, catch some music at the Fox Theatre, enjoy a Film Festival at The Loft or cheer the U of A Wildcats on to victory. The desert lifestyle is about comfort and diversity. Let me show you the wonders we have to offer! Real Estate Is About People...Hopes...Lives....DreamsLets fulfill yours together! The foundation of my business is based on residential property. That being said, I have built my walls on land & investment property. I am working on the roof, which is commercial property. One specialty that I have worked hard to develop is working with clients who are based out of town. Being able to communicate effectively through phone, email, and utilizing software to capture the essence of a property & its neighborhood allows us do develop a "feel" for an area that isn't seen by just looking at an info sheet. Keeping a seller apprised of what is going on with their listing and those it is competing with gives us an opportunity to employ best practices & new strategies to market it wisely. Regular attendance at seminars outlining growth strategies and projects planned for Pima County and Greater Tucson give me insight into not only what is happening now, but what will be happening down the road. Knowledge is power, and my clients deserve an agent who is dedicated to learning & implementing the education that is available. I am very active in both my community & within the industry - serving the national level on the NAR Board of Directors, at the state level as a Director & on the Legislative Policy committee (helping protect private property rights and policy decisions affecting real estate in Arizona). After all, real estate is about communities, the people and the decisions that affect them. Mr. Simpson and his wife are true professionals. They were there to assist us every step of the way. The purchase transaction was made much more easier because of Mr. Simpson. In my opinion he did more that just make a sale. 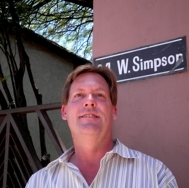 Buying property is not much fun but with Mr. simpson's help it was enjoyable. He and his wife get a thumbs up from us. Kent has been great to work with. I just closed a small commercial property with him as my agent. Kent handled every detail promptly and was one step ahead of all the parties involved all the way through the process. He is a true professional that is at the top of his game. great video about the property. immediate response to any questions. moved the sale along. willing to go the extra mile to keep things on track. easy and pleasant to work with. I recently had the pleasure of working with Kent Simpson for several weeks. I am the most discriminating buyer and he worked with me both tirelessly and patiently. Kent possesses a broad understanding of the Tucson real estate market. Because of this knowledge he was able to streamline my search, saving both time and effort. Kent exhibited a strong ability to listen to me and understand my needs. Because of these traits, I would wholeheartedly recommend him to both the first time home buyer and the seasoned veteran. My husband and I were extremely impressed with Kent. He led us through the whole process of finding and buying a home in a very professional and respectful wayWe would highly recommend Kent to others. In fact, we recommended him to family members. He is trustworthy kind, courteous and very helpful....a true gentleman! Kent is someone who will take care of all the details and guide you through the process of buying a home, making it a happy win-win situation for everyone. He is very patient and will explain to you the details of the home buying process as you go along. He made the whole process smooth and seamless. Kent really knows his stuff! I am most impressed by his patience during what I would suspect was a difficult transaction, given the many bumps in the road we experienced. Truly, if it weren't for him we would not be packing and moving into a beautiful house at this very second!! There are not enough words to describe how happy and appreciative we are.